Note: this post is outdated, you should take a look to this more recent article. This post aims to present how to create a simple control object, namely a slider, using the CCControl I presented in the previous article. To illustrate how to incorporate the CCControl into your project and how to use it, I decided to start with the very simple CCSlider from the cocos2d-iphone-extensions. This object provides a quick way to add a slider into a Cocos2d project. In the first part I’m going to show you how to integrate the CCControl instead of using a protocol to send the new value, and in a second part I’ll make some improvements to the code more robust and to make it easier to read (and so more maintainable). # init cocos2d-iphone submodule in order to build & run the tests. Once the cocos2d-iphone-extensions ready to use, download the CCControl files (.h and .m) here: CCControl repository. Show the Project navigator in the right sidebar. Control-click on your project file. Choose Add files to ‘cocos2d-extensions-ios’. 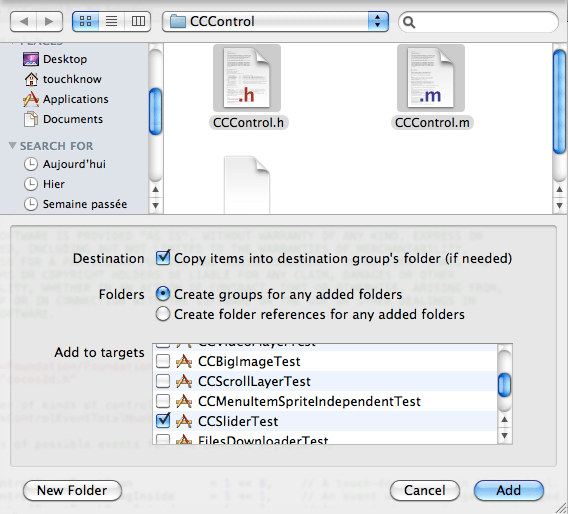 Browse to your CCControl files, check CCSliderTest target and click Add (Check the “copy items” option). Then replace the superclass of the CCSlider by the CCControl (which extends CCLayer too). Compile and check that all it’s ok. The project is now set up correctly and we are able to work with the CCSlider and the CCControl. First of all we are going to replace the delegate logic by the target-action pattern supplied with the CCControl. Start by removing the CCSliderControlDelegate protocol from the header. Then remove the “id<CCSliderControlDelegate> delegate;” defines in the interface. And to finish remove the corresponding (delegate) property directive. The “sendActionsForControlEvents:” method calls all the target actions which have been registered for the given control event (here CCControlEventValueChanged). The CCSlider is already… ready! It was really easy no?! We just needed to remove the delegate and replace its defined method by one provides by the CCControl. This saves a few lines of code and mainly it has made our ​​life easier with the management of receivers (registration and sending messages). So now we are going to modify the slider test file. // Change value of label. When the value of the slider will change, it’ll call this method passing itself as parameter. To retrieve the slider’s value we just have to call its accessor. This will register the CCSliderTestLayer’s “valueChanged:” selector for the CCControlEventValueChanged event. It means that if the value of the slider changes, the “valueChanged:” method on the target will be called with the slider as parameter. It’s finished! Now compile the project and all should work as before! As you can appreciate, it’s really easy to integrate a CCControl into your project. You just have to extend the CCControl class, send an event when you need, and the side of the receiver, listen to this event. In the following part we’ll see how to improve the CCSlider. Using the slider you may notice few problems like the fact that the value is changed only when we released the button or the fact that the thumb does not hold correctly when you move too fast. In this section I will so provide some small fix to improve it. For the moment we have just defined private properties for all instance variables, but later we’ll add some private methods. 1. Sets the background and thumb sprites as instance variables (they are retained!). 2. Defines the content size. This will allow the superclass to define when there is whether an interaction on the control. Cool, we have now cleaned the code. You may have noticed that there are two portions of codes to manage the user interactions, one for the touch events and an another for the mouse events. However they have exactly the same function, update the value and the thumb sprite position. So now we are going to refactor this to make it more maintainable. The important part here is the isTouchInside/isMouseInside call. These methods are provide by the CCControl superclass and uses the layer contentSize to know if the touch/mouse event is inside the component. So now you can remove the “isTouchForMe:” because we don’t need it anymore. Ok, it’s finished! Now all must work well! This tutorial has shown you in a first time how to use the CCControl with the CCSlider, and in a second part we have improved the original code to remove some weird behaviours. I hope this could helps someone. If there’s anything you need, please feel free to put a comment and I will try my best to help you. You can download the final project on github. Should i add it manually ? This is weird. The kCCRepeatForever is define into the Cocos2D file: ccMacro.h. So if the constant is undeclared you should check the link with the Cocos2D framework files. which cocos2d version am i suppose to use ? Also i’ve seen your working on a gauge (like a life level bar? ), i am very interested in it. Can you tell me when you release it please ? How to use color picker control??? I am working on coloring sketch book project… i wanted to use this color picker control? do you have any sample example of how to use it? Yes you can donwload the samples into the github repo. There is an example which uses the color picker. It is not really easy to custom for the moment because you’ll need to create a sprite-sheet with (if possible) the same sizes.